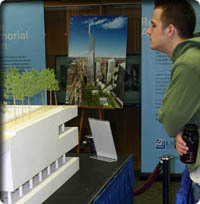 Governor George E. Pataki today announced the opening of a World Trade Center Memorial Exhibit at the SUNY College of Environmental Science and Forestry which includes models, renderings, and animations. Reflecting Absence, an over four-acre memorial, will honor all those lost in the terrorist attacks of September 11, 2001 and February 26, 1993. “I want to encourage the public to visit the memorial exhibit while it is available at SUNY College of Environmental Science and Forestry or at one of the other locations throughout the state that it will soon be traveling to. Our State, our nation, and over 92 countries lost family, friends, and neighbors on September 11th. We will share this memorial with the entire world,” the Governor said. The exhibit will be open for public viewing in the Moon Library beginning at 11 a.m. on Saturday, February 12 through Thursday, February 24. The exhibit will feature a large scale model of the memorial and site plan for the World Trade Center site including the Freedom Tower, and an additional model that depicts the three levels of the memorial. Memorial Designer Landscape Architect Peter Walker will present the newly completed schematic design to the community and the press on Thursday, February 24 at 4:00 p.m. at the Marshall Hall Auditorium. After the exhibit in Syracuse, the memorial display will travel to Watertown, Rochester, Buffalo, Binghamton, and Hauppauge before returning to its permanent exhibit at the World Financial Center, across from the World Trade Center site. The memorial features a lively landscaped civic plaza with two massive voids aligned with the footprints where the twin towers once stood. Other features include a large ceremonial one-and-a-half acre clearing on the plaza level and a gallery on the second memorial level where the names of those lost on September 11, 2001 and February 26, 1993 can be viewed while water cascades behind them. The design allows visitors to enter the memorial between the footprints and descend down to the memorial level. The memorial level includes Memorial Hall connecting the two viewing galleries that surround the reflecting pools and whose exterior walls delineate the original footprints. Between the two pools, and off Memorial Hall, visitors will be able to travel down to the lowest level of the memorial where the Contemplation Room that houses a tomb for the unidentified remains, family area, and space for the medical examiner are found. On the lowest level, the exposed box beam remnants can be seen and touched and in the northwest quadrant, visitors will see and touch the massive edifice of the exposed slurry wall. As visitors return above ground to the plaza level, the surrounding trees mediate their return to daily life. In January of 2004, a 13-member jury selected Reflecting Absence by Michael Arad and Landscape Architect Peter Walker as the design for the World Trade Center Memorial. Their design was selected from over 5,000 international submissions. In April of 2003, The Lower Manhattan Development Corporation (LMDC) launched the international World Trade Center Site Memorial Competition. Guidelines for the competition were developed based on the memorial mission statement and program. These guiding documents were developed by two separate volunteer committees, comprised of family members, residents, survivors, first responders, arts and architecture professionals and community leaders. The documents were shaped by thousands of public comments generated at public meetings in every borough, Long Island, Connecticut and New Jersey, as well as comments received from around the world through letters and the LMDC's website. In what became the largest design competition in history, 5,201 submissions were received from 63 nations and 49 states. All 5,201 proposals were evaluated by a 13-member memorial jury comprised of individuals representing various points of view, including world renowned artists and architects, a family member, a Lower Manhattan resident and business owner, representatives of the Governor and New York City Mayor Bloomberg, and other prominent arts and cultural professionals. The jury evaluated proposals in a two stage process based on how well each design expressed the mission statement and program, as set forth in the competition guidelines. On Thursday, February 24 the exhibit will be in the Marshall Hall Auditorium beginning at 12:00 am and at 4:00 pm Memorial Designer and Landscape Architect Peter Walker will present the newly completed schematic design. More information and additional renderings are available at www.RenewNYC.com.